After last week’s renewed EUR strength this time all the attention was not concentrated neither on the US Dollar nor on the European currency. With the EUR crosses ranging between close horizontal levels the week was mostly about the Canadian Dollar weakness. With the Crude price reaching the 35 USD from 2009, the Canadian currency proved its direct correlation and every CAD cross proved it. USDCAD reaching 1.37 – a level not seen since 2004. The Australian Dollar was also showing some extra strength but on Friday gave away almost all the ‘gains’ from the previous days. Another surprise came from the strength from the Japanese Yen with the USDJPY finally breaking the range from the previous weeks. The Indices lost all the gains from the apparent recovery from the past couple of weeks. The DAX opened up strong on Monday but dropped continuously to 10270 on Friday. As usual, the FTSE and all European Indices followed and dropped down to prices of beginning of November. In the US, the NASDAQ retested the 4730 level and failed to go any further as price fell over 100 points on Friday. S&P and the DOW also pulled down giving back all the gains for last month. On the commodities side, Gold still stuck to the 1080 level after breaking new lows last week while Silver retested the six year lowest at 13. As for Crude there seems to be no bottom as price continues to rally to the downside this time reaching 35 USD. 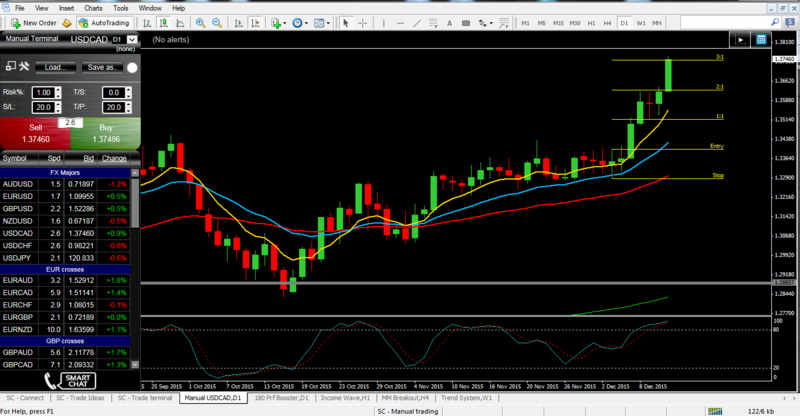 USDCAD (Daily Chart) – Continuation Long – 03.12.2015 – Showing clear higher highs and higher lows on the last few weeks, the pullback at the beginning of the month ended on the low test bar on the 3rd. Currently at +3% in profit. This week will start with the morning speech from the ECB President Mr. Mario Draghi on Monday which is always interesting to say the least. On Tuesday we’ll be paying attention to the inflation numbers from the US. But this week, it is all going to be about Wednesday – this might be the first time in 10 years when the Federal Reserve decides to hike the interest rates. And it will all be about the market perception on whether this is a positive signal meaning the economy is doing well. Then, is the number already included in the recent price action? There is also the other side – what if the rates aren’t hiked? Will the investors see it as weakened economy… It will be very interesting to watch the result and immediate influence on the markets and the ongoing volatility around the US Dollar and all USD denominated assets. Regarding our trades and open positions there is only one thing to do – protection. In terms of news, the week ends with the press conference from Bank of Japan.